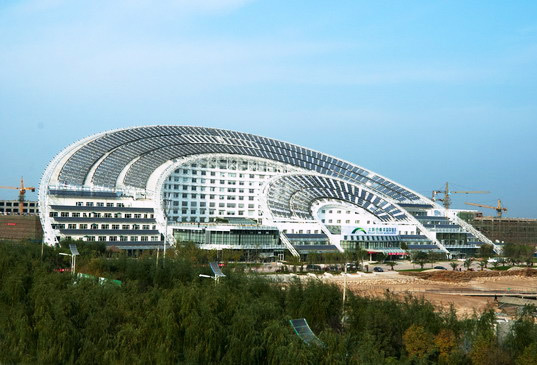 This vast fan-shaped compound in China is the "largest solar-powered office building in the world". 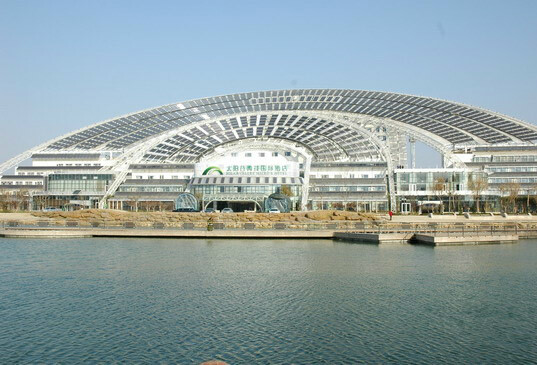 Located in Dezhou in the Shangdong Province in northwest China, the 75,000 square meter structure is a multi-use building and features exhibition centers, scientific research facilities, meeting and training facilities, and a hotel - all of which run on solar power. The design of the new building is based on the sun dial and “underlines the urgency of seeking renewable energy sources to replace fossil fuels.” Aside from the obvious sustainable nature of the solar panel – clad exterior, other green features include advanced roof and wall insulation practices resulting in an energy savings of 30% more than the national standard. In addition, the external structure of the building used a mere 1% of the amount of steel used to construct the Beijing Bird’s Nest. The solar-powered building was the main venue for the 4th World Solar City Congress. i just wanna know how this building was made..it really resembles to our project..the difference is this building is slanted..ours is standing 90 degrees..
thats awesome engineering ,,,,,,,,,,,,,,,,, and we pride to be a "civil engineer"
Wonderful, what a super good idea! It would also be a good idea to connect a building to an external source of solar panels using a secure DIGITAL CONNECTION. This would fit well into the idea of the SMART GRID and the SMART METERS and would be suitable for existing buildings which often have a construction which is not suitable for placing so many solar panels on the roof. Such a system is developed by GPX. To me I believe that making a building like this is a waste of time.....it looks like the super bowl cut in half....why make a full glass, solar paneled building.....really dumb idea. I couldn't agree more. Seems like Chinese architects are merely making a poor copy of Japanese anime. Hey I wonder if anybody remembers the movie Appleseed. The design of the new building is based on the sun dial and "underlines the urgency of seeking renewable energy sources to replace fossil fuels." Aside from the obvious sustainable nature of the solar panel - clad exterior, other green features include advanced roof and wall insulation practices resulting in an energy savings of 30% more than the national standard. In addition, the external structure of the building used a mere 1% of the amount of steel used to construct the Beijing Bird's Nest.